Nestled in the countryside just outside Youngsville in Granville County, Cedar Grove Acres is a fairly new wedding venue offering a large working farm feel for your outdoor wedding. The current owners, Paula and Richard, bought the 30-acre homestead and are planning some great things for the venue in the future. They also happen to be two of the nicest and most friendly venue owners I have ever met while photographing a wedding. 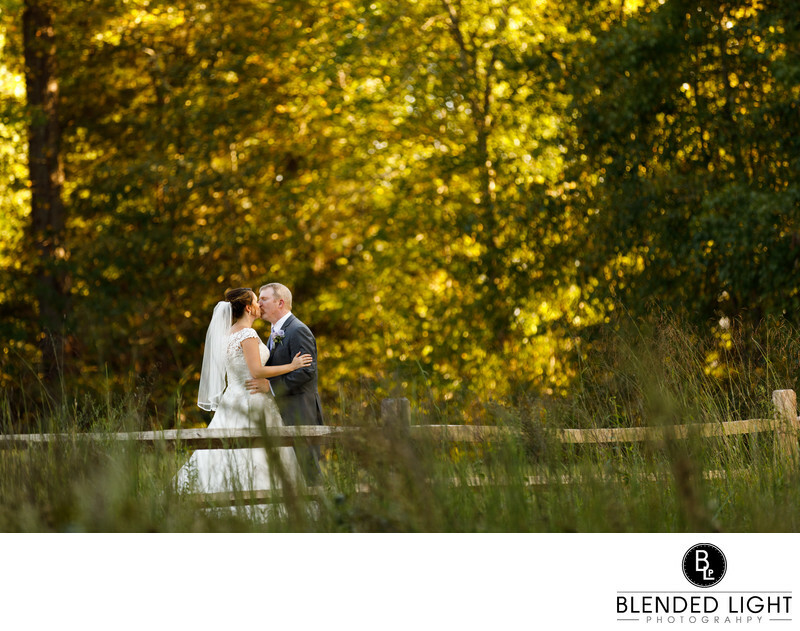 As the late fall sun began setting behind the tall tree lined ceremony site, I was looking for a angle that would give me a glowing background while giving a sense of environment. We had worked several places around the fence, but I hadn't found quite the right spot. I was actually setting up a tighter shot on my bride and groom when I noticed the glow behind them. I quickly made my original shot and then grabbed my second camera with a wider lens. I moved quickly to change the position of the flash I was using. My original composition center then directly on the sunlight's warm glow on the trees in the background. Upon reviewing it though, I realized that the bride's light dress was disappearing against all the bright leaves. So, I shuffled to my right to change the angle slightly, placing them in front of the darker trees and magic was made. I included the fencing and grasses in the image as a small but pertinent foreground element. The couple had planned their wedding start to finish and the DIY, rustic feel carried through from the decorations to the music they danced to. With that mood prevailing through the day, the fence felt right in place in the image. And, In case you are wondering, the only direction I gave them was to face each other. They took it from there to create this beautiful couple's portrait with a romantic and connected feel to it. Other than the natural charm of the rolling farm land, the owners have put great thought into the design. The outdoor wedding location is amply surrounded by tall trees, creating a shady location for those mid-to-late afternoon weddings. And, In the event of rain, the farm includes a covered barn, equipped with pews, giving a true rustic feel to the ceremony. Provided with good weather, most couples will choose to have their reception in the gravel drive located between buildings and lit by a number of string lights overhead. But if dining covered-style is more along your thought lines, across from the ceremony barn there is yet another large barn capable of becoming both a dining area and dance floor all on one. And the dance floor, while covered, is open to take in the beauty of the surrounding woods. If you are looking for a charming venue with a rustic feel, look no further than Cedar Grove Acres. And I would love to work with you on your wedding day at such a gorgeous venue so contact me if I can help. Location: 3123 Brassfield Road, Creedmoor NC. 1/200; f/2.8; ISO 100; 200.0 mm.